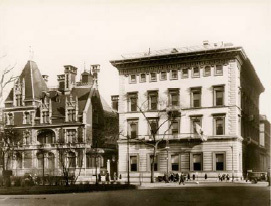 On the evening of February 20, 1891, a group of distinguished gentlemen, prominent in the civic, commercial, financial, and social life of the City gathered together for an important purpose at the invitation of William Watts Sherman at the Knickerbocker Club - then at 319 Fifth Avenue, the northeast corner of 32nd Street. At this dinner were present Messrs. Samuel D. Babcock, George S. Bowdoin, Robert Goelet, George G. Haven, H. A. C. Tylor, William K. Vanderbilt, and William C. Whitney. After dinner they were joined by Messrs. John L. Cadwalader, Charles Lanier, Cornelius Vanderbilt, James M. Waterbury, and proxies were on hand from the Messrs. Ogden Goelet, Louis L. Lorillard, J. Pierpont Morgan, James A. Roosevelt and Frank K. Sturgis. A meeting ensued at which the Articles of Affiliation were signed and the first officers duly elected, and The Metropolitan Club was formed - with J. Pierpont Morgan becoming the first President. Following the meeting, so swiftly did the organization work that only a month later, on March 25, 1891, the membership had been secured and the financing of a great clubhouse completed. The original land was bought through the contribution of $5,000 by each of the twenty-five original Governors. The land on which the Clubhouse stands - 100 feet fronting on Fifth Avenue and 200 feet on 60th Street - was acquired from the Duchess of Marlborough who signed the purchase agreement in the United States Consulate in London. Mr. Cornelius Vanderbilt, who represented the Governors, signed for the Club. At that time, the old Fifth Avenue stages, with dark blue panels and running gear in red, jolted and rumbled slowly up and down the Avenue over the rough granite cobblestones, while on Madison Avenue the horse-driven yellow street cars pursued the uneven tenor of their way upon the car tracks. The hansom cabs, the victorias, and in winter, the sleighs still drove through Central Park. In such a day and age The Metropolitan Club and its ensuing tradition had its origin. In those leisurely times, three years were required to build and furnish the Clubhouse. The first dinner was one that the Governors attended on February 20, 1894, in what is now the Manager's Office on the First Mezzanine and what was the Strangers' Dining Room. On February 26th, the house was viewed by the Press and on the following day, a Sunday, it was turned over to the members. On April 17, 1894, the Finance and Building Committee discharged itself, reporting that the cost incurred and fully paid was $1,777,480.20 and the Committee had, additionally, $122,519.20 in the bank. At the turn of the century these were staggering figures. The dormitory wing on the East Side of the Court now known as the Annex - was acquired twenty years later.